Despite the undeniable migration toward cloud-based unified communications (UC), a significant number of new premises-based IP-PBX systems entered the market in 2014 (and early 2015). Business communications manufacturers are working hard to build out their cloud UC offers, but they also continue to enhance hardware and software for on-site deployments, and over the past year, many of these vendors introduced new IP-PBX systems that extend their reach into additional market segments. Below is a run-down on new IP-PBX systems in 2014 (and early 2015), grouped generally by target market though each can cover a range of capacities. Cisco has introduced the new Business Edition 6000S, an all-in-one business collaboration platform built into a Cisco 2921 Integrated Services Router (ISR) with a Cisco UCS-E server blade on which five pre-configured and “essential” virtualized applications are running. BE6000S targets the low-end of the mid-market or branch offices with 25-150 users and introduces a smaller scale, more cost-effective version of the full Business Edition 6000 virtualized telephony platform designed for mid-market organizations with up to 1,000 users. The new BE6000S fills a gap in Cisco’s product line, following the January 2014 end-of-sale of the company’s line of on-premises business telephony platforms for small and mid-sized businesses (SMBs). The product has been orderable since December 2014, with generally availability as of January 30, 2015. See the write-up “Cisco Introduces Business Edition 6000S for Smaller Offices” for more detail. Epygi Technologies, a U.S.-based designer and manufacturer of business telephony solutions, unveiled a new line of “QX” telephony solutions in October 2014, including the new QX200 IP-PBX designed for offices with up to 200 employees and the QX50 IP-PBX designed for smaller offices with up to 50 users. Epygi’s IP phone systems have long been designed as affordable, easy-to-administer all-in-one IP-PBXs with voicemail, unified messaging and interactive voice response among the standard features. The new QX IP-PBXs add a number of built-in productivity applications which are easily activated by software license key (no additional hardware required) for call center, unified communications, mobility and video. See the write-up “Epygi Transitions to the QX Product Line ” for more detail. NEC began shipping the UNIVERGE SV9100 Communications Server in October 2014. The system is not entirely a new offer, but represents the next version of the company’s premises-based SV8100 telephony platform for SMBs, introducing a simpler design and new licensing concept with embedded, license-activated capabilities. The SV9100 comes in two server models. The SV9100”S” (Small) is designed as a cost effective, TDM-focused option for smaller businesses with up to 48 users. The SV9100”E” (Expanded) is an IP/TDM appliance that typically serves the under 100-user business, but can scale to handle as many as 896 users across up to 50 sites. See the write-up “NEC Launches Next Generation UNIVERGE SV9000 Series” for more detail. Panasonic recently announced the new KX-NS700 communications server for SMBs with a need for up to 288 extensions, including up to 160 analog or digital extensions and up to 128 IP extensions. The system offers scale and functionality over and above the company’s earlier KX-NCP500/1000 and KX-TDE100/200 converged digital/IP systems. Notable features include built-in voicemail with email notification (expandable via licensing), an embedded call center capability and license-activated One-Look Networking software that connects multiple KX-NS700 servers and the earlier, higher-capacity KX-NS1000 server as a single system with centralized administration and reporting. A new mobility application called Communications Assistant (CA) RCS joins the CA suite to support unified communications, including video calling and chat, on an iOS or Android smartphone or tablet; CA software is pre-installed on the system’s main processor. The KX-NS700 is generally available in the U.S. as of February 9, 2015 from authorized Panasonic resellers. Unify (formerly Siemens Enterprise Communications) introduced a new OpenScape Business appliance in June 2014 that is designed specifically for small businesses, branch offices and home offices that have fewer than 30 users. The new X1 platform is an all-in-one solution with voice, unified communications and mobility capabilities built-in, giving the small business valuable functionality at an affordable price. The entry OpenScape Business X1 joins three higher capacity hardware options (the X3, X5 and X8 appliances), as well an IP-only software version. See the write-up “Unify Targets Under-30 User Segment with OpenScape Business X1 ” for more detail. Vertical Communications released Summit in July 2014 as a new communications appliance designed for smaller businesses looking for a cost effective phone system with popular telephony functionality built-in and some more advanced applications, such as an Android and iOS SIP client application and IP softphone, which are embedded and easily license-activated. Summit is positioned as a medium IP key system suitable for businesses with 5-50 users (the “sweet spot” in terms of optimal cost-effectiveness), but can scale to 140 extensions using one of four basic system units and one expansion unit. Summit can be part of an IP network (up to 250 sites) with Vertical’s small SBX IP and larger MBX IP key systems. See the write-up "Vertical Introduces Summit IP/TDM Platform for Small Business” for more detail. Zultys introduced the all-in-one MX-SE premises-based IP phone system in October 2014 for small offices with up to 50 users. The MX-SE replaces the company’s earlier MX30 (30 users) as a new hardware platform with higher scale, full T1/PRI/E1 support, increased memory and more processing power. The Zultys MX solution is known for “all-in-one” functionality that embeds capabilities like voicemail and call center as standard features, with other collaborative functions built-in and easily license-activated as needed, including unified messaging, meet-me conferencing and the company’s MXIE UC client application for desktops and mobile devices. Additional applications can be added optionally. Avaya continues to evolve the IP Office communications platform for small and mid-size organizations and enterprise branch offices. The latest release (December 22, 2014) further expands the addressable market, introducing a new offer called IP Office Select which raises the capacity, improves resiliency and enhances the functionality to serve larger mid-market customers with up to 2,500 IP users across up to 150 sites. A virtualized version can be deployed on-site or in the cloud. IP Office R9.1 also integrates Web collaboration and adds other unified communications improvements. See the write-up “Avaya Expands Addressable Market with IP Office Select” for more detail. Epygi Technologies, a U.S.-based designer and manufacturer of business telephony solutions, unveiled a new line of “QX” telephony solutions in October 2014, including the new QX2000 IP-PBX designed for mid-range and larger enterprises with up to 2,000 users. QX2000 replaces the now discontinued QX1000 IP-PBX, the company’s original entry into the enterprise market in 2011. Epygi’s IP phone systems have long been designed as affordable, easy-to-administer all-in-one IP-PBXs with voicemail, unified messaging and interactive voice response among the standard features. The new QX IP-PBXs add a number of built-in productivity applications which are easily activated by software license key (no additional hardware required) for call center, unified communications, mobility and video. See the write-up “Epygi Transitions to the QX Product Line” for more detail. Grandstream introduced the UCM6510 IP-PBX in October 2014 as a new communications appliance aimed at mid-size enterprises with up to 2,000 users. UCM6510 is a compact unit that is easy to install and manage and enables some more advanced voice, video, mobility and data capabilities, without the licensing fees or recurring fees often required by competing solutions. Grandstream is also providing free firmware updates for the life of the product. The new UCM6510 represents the second IP-PBX appliance in Grandstream’s Asterisk-based UCM line-up after the company re-entered the IP-PBX market in 2013 with a smaller appliance, the UCM6100 with scalability to 500 users. See “Grandstream Targets the Medium Enterprise with New Communications Appliance” for more detail. NEC began shipping the UNIVERGE SV9300 Communications Server in November 2014. The system is not entirely a new offer, but represents the next version of the company’s premises-based SV8300 platform. Both are IP/TDM appliances with the same user capacity of 1,536 users, but the new SV9300 supports a higher SIP trunk capacity, now 512 SIP trunks (up from 96) and networking of 50 sites as a single system image. The SV9300 also introduces a new licensing concept with embedded, license-activated capabilities. The system is a good fit for mid-size businesses due to its scalability and support for more sophisticated applications, including NEC’s UC for Enterprise collaboration suite, as well as vertical-specific solutions from NEC for the hospitality, healthcare and education industries. Panasonic expanded its business phone system portfolio with a new IP- and SIP-based communications platform called KX-NS1000 designed for small to mid-size businesses. The new system, which began shipping in the U.S. in January 2014, scales from 10 to 1,000 networked users across up to 16 locations. As an all-in-one communications platform, the KX-NS1000 combines telephony, collaborative applications and built-in, centralized management tools in a single 19-inch rack-mount unit. The solution targets growing businesses looking to unify dispersed offices and remote employees into a cohesive system that is flexible to deploy, easily expanded and which ensures business continuity across locations. See “Panasonic Launches KX-NS1000 IP Communications Platform in U.S.” for more detail. Toshiba America Information Systems Inc., Telecommunication Systems Division released the IPedge Virtual Server in early January 2015. The new solution is a virtualized software-only version of the company’s IPedge business communications system that allows IPedge to co-reside with Toshiba’s contact center and reporting software on a single server running VMware vSphere technology. The IPedge Virtual Server is currently focused on the mid-market, but is available in different configurations to meet varying capacity and redundancy requirements. The largest Virtual EM Server scales to 1,000 users, including up to 360 contact center agents. See the write-up “Toshiba Combines Call Control and Contact Center on New Virtual Server Platform” for more detail. Cisco began shipping a new Business Edition platform called Business Edition 7000 in first quarter 2014 that is packaged and price-optimized for enterprises with 1,000 to 5,000 users (though there is no enforced capacity limit). BE7000 comes preloaded with a number of Cisco unified communications and collaborative applications and is ready-to-run without the complex installation, setup and management typically associated with Cisco’s Unified Communications Manager and add-on collaborative solutions. In addition, scaling up to add more users, devices and applications is more easily accomplished due to the system’s modular, stackable design. See the write-up “Cisco Business Edition 7000 Targets Enterprises with 1,000-5,000 Users” for more detail. NEC released the UNIVERGE SV9500 Communications Server in October 2014. The system is not entirely a new offer, but represents the next version of the company’s premises-based SV8500 platform and is the first virtualized SV9000 offer. SV9500 is designed for larger enterprises running a VMware virtualized environment and will handle 4,000 users per system or 192,000 networked users at maximum capacity (the software can also be preinstalled on an NEC server or comes as a telephony appliance). The system is a good fit for vertical markets such hospitality, healthcare and education, as it can combine with NEC’s UC Attendant for Hospitality, a TeleCare solution that integrates GoogleGlass, and a cloud-based content management and collaboration solution for schools. Samsung Telecommunications America, LLC (STA), a Dallas-based subsidiary of Samsung Electronics Co., Ltd., expanded its North American portfolio in early 2014 with new solutions for the enterprise, including a new server-based telephony system called the Samsung Communication Manager. SCM is a SIP-based all-in-one communications solution with enterprise-grade call control and embedded, license-activated applications for unified communications, conferencing and mobility – all on a single Linux-based server that is designed for easy installation and management. Samsung sees multi-location companies with 500-2,000 registered users as a good target market initially, but SCM can actually handle up to 3,000 users per server (SIP phones), or up to 6,000 users in an Active-Active redundancy mode. See the write-up “Samsung Telecommunications America Rolls Out New Products for the Enterprise” for more detail. Avaya continues to evolve the Avaya IP Office communications platform for small and mid-size organizations and enterprise branch offices. The latest release further expands the addressable market, introducing Avaya IP Office Platform Select that scales to support larger mid-market customers with more sophisticated requirements. At the same time, new IP Office software (Release 9.1) adds Web collaboration and other unified communications improvements across all IP Office models. Today, IP Office is offered in several different deployments to fit varying size enterprises and feature requirements. IP Office continues to be available as an IP/hybrid platform for the small and mid-size business (SMB) market, with the IP Office 500 version 2 (IP500 V2) control unit handling up to 384 IP or TDM users (Basic, Essential or Preferred Editions are available). In 2012, Avaya expanded IP Office to serve the mid-market with the Linux-based IP Office Server Edition which now supports up to 2,000 IP users in a single site or across up to 32 sites. The new Avaya IP Office Select, generally available as of December 22, 2014, represents a new offer that further raises the capacity, improves resiliency and enhances the functionality to serve larger mid-market customers with up to 2,500 IP users and up to 150 sites. A virtualized version can be deployed on-site or in the cloud. Avaya IP Office Select can handle up to 2,500 users across 150 sites on a single server or in a single virtual instance, up from 2,000 users and 32 sites with the earlier Server Edition. Both the IP Office Server Edition and the new IP Office Select are fully qualified and validated to run on Dell R620 servers or as a virtual instance under VMware vSphere (software supplied as an Open Virtual Appliance or OVA), as well as on Dell R210/R220 servers. However, a Dell R620/OVA server is required to achieve the full IP Office Select capacities. Other specified server models from Dell or HP can be deployed, but support lesser capacities. IP Office Select software also increases other capacities, including support for 250 voicemail ports (up from 150 ports on non-Select versions), 500 hunt groups (up from 300) and 50 SoftConsoles (up from 30) among other improvements. The built-in meet-me audio conferencing resource is now a 512-port resource that can support two 256-party conferences or other combinations. R9.1 embeds IP Office Web Collaboration, a derivative of Avaya Aura Conferencing that is modified for IP Office and mid-market companies that require audio and Web conferencing, desktop and application sharing and white boarding. The solution is part of the base software for IP Office Server Edition and the new IP Office Select and includes a 512-port meet-me audio conference resource if IP Office Select is running on Dell R620/OVA server (maximum conference size is two 256-party conferences, or other combinations such as 171 3-party conferences, etc.). IP Office Web Collaboration can also run on a standalone Avaya one-X server for additional scale and runs on an external Application Server if used with the IP Office Preferred Edition. A native video capability is on the IP Office roadmap. For now, Avaya supports three options for video: the licensed IP Office Video Softphone (now for Mac users only; the Windows version is discontinued as of R9.1); the external Avaya Video Collaboration Solution for IP Office (8-party video) or a subscription to the AvayaLive Video cloud service sold by “rooms” which will be the likely choice for most mid-market companies (25 participants per room). A hosted version of IP Office is currently in controlled release and testing with 10 Avaya partners, including Avaya distributors and regional partners. General availability is expected in the first half of 2015. The cloud solution is based on IP Office Select and will support businesses with 25-2,500 users. The service packages sold to end customers, powered by Avaya IP Office, will be defined by each hosting partner. For example, last May, distributor SYNNEX Corporation announced it would offer a hosted solution based on the Avaya IP Office Platform as part of its SYNNEX CLOUDSolv technology portfolio, with two packages as defined by SYNNEX: (1) Business Communications including voicemail and (2) Full Unified Communications including mobility and desktop integration. Similarly and more recently, technology distributor ScanSource Catalyst announced it will introduce a new cloud offer based on Avaya IP Office and hosted by ViaWest, a colocation, managed services provider in North America. This pay-per-user-per-month model will have two user options: Telephony Plus and Advanced UC. Avaya IP Office R9.1 also adds other new capabilities, including branch enhancements if IP Office is deployed in branch offices within an Avaya Aura network, improvements to the security and user experience of the one-X Mobile Preferred mobile client application and new capabilities for the IP Office Web Manager, to name a few. IP Office 9.1 and IP Office Select are generally available as of December 22, 2014. Customers that want the increased scale and capabilities of IP Office Select purchase IP Office Select software and Select licensing (this includes current IP Office customers that will need to upgrade their base software from standard IP Office to IP Office Select). Cisco announces Business Edition 6000S, an all-in-one business collaboration platform built into a Cisco 2921 Integrated Services Router (ISR). BE6000S targets the low-end of mid-market or branch offices with 25-150 users, introducing a smaller-scale, more cost-effective version of the full Business Edition 6000M/H virtualized telephony platform which targets mid-market organizations with up to 1,000 users. The new BE6000S fills a gap in Cisco’s product line, following the January 2014 end-of-sale of the company’s line of on-premises business telephony platforms for small and mid-sized businesses (SMBs), namely the Cisco Business Edition 3000, the Unified Communications 300 Series and the Unified Communications 500 Series. At that time, Cisco’s virtualized platform, Business Edition 6000, became the recommended on-premises alternative, though the price point was considered too steep and the deployment too complex for some smaller organizations. BE6000S addresses price sensitivity and deployment complexity by offering a simplified office-in-a-box solution, pre-configured with “essential” applications that are typically required by smaller offices. The BE6000S, including hardware, licenses and services, is priced approximately 20% less than a BE6000M, according to Cisco. Additionally, all BE6000 models support a new option for preconfigured settings whereby Cisco will configure the core applications prior to shipping the system to the partner, speeding up the deployment process. BE6000S is generally available as of January 30, 2015.
Business Edition 6000 was originally introduced in 2011 as a virtualized telephony and unified communications platform designed for organizations with up to 1,000 users. The solution uses VMware virtualization technology to consolidate multiple applications - voice, video, conferencing, messaging, instant messaging and presence, contact center and more - on a single platform for a lower total cost of ownership. Business Edition platforms support high availability features for mission critical environments and utilize a centralized branch deployment architecture that unifies dispersed offices and remote employees into a single, cohesive system. To be specific, Business Edition 6000 uses VMware virtualization technology to run multiple virtual machines, allowing pre-loaded and licensed Cisco applications to run co-resident on a single Cisco Unified Computing System (UCS). These include “foundational” applications that are typically used together to deliver core voice and unified communications features, namely the Cisco Unified Communications Manager for call control, Cisco Unity Connection for voicemail and unified messaging, Cisco Instant Messaging and Presence Service with Cisco Jabber and Cisco Prime Collaboration for initial deployment and provisioning. The Cisco Paging Server for point-to-point and group audio paging is included on the new BE6000S platform, or optionally activated on the medium-scale models (BE6000M and BE6000H). Additional applications complement the core applications above and are available and ready-to-activate as needed on the medium-scale models (BE6000M and BE6000H): Cisco Unified Contact Center Express, Cisco Unified Attendant Consoles, Cisco Emergency Responder, Cisco Expressway and Cisco Telepresence Conductor, Cisco TelePresence Video Communication Server, Cisco TelePresence Server Virtual Machine and Cisco TelePresence Management Suite. Additionally, Business Edition 6000 can integrate with Cisco’s cloud-based WebEx Web conferencing service. Business Edition 6000 now comes in three models to suit varying size enterprises and feature requirements. The “H” (high-density) model is suitable for medium to large deployments. A high-density Cisco UCS C220 M3 1RU Rack Mount Server, with a pre-installed virtualization hypervisor, supports eight of the collaborative applications listed above and the provisioning application simultaneously for a total of nine (9) applications. Maximum capacities include 1,000 users, 2,500 devices and 100 contact center agents. The “M” (medium-density) model is suitable for medium-scale deployments. A high-density Cisco UCS C220 M3 1RU Rack Mount Server, with a pre-installed virtualization hypervisor, supports four of the collaborative applications listed above and the provisioning application simultaneously for a total of five (5) applications. Maximum capacities include 1,000 users, 1,200 devices and 100 contact center agents. The “S” (small-density) model, suitable for small-scale deployments, runs on the Cisco 2921 Integrated Services Router (ISR) and UCS E160D M2 blade server, with a pre-installed virtualization hypervisor and integrated routing gateway. This all-in-one platform supports the following five (5) fixed, preconfigured core applications: Cisco Unified Communications Manager, Cisco Unity Connection, Cisco Unified Instant Messaging and Presence Service with Cisco Jabber, Cisco Prime Collaboration Provisioning and the Cisco Paging Server. Maximum capacities include 150 users and 300 devices. Note that customers deploying the BE6000S can migrate to BE6000M or BE6000H, retaining telephones, hardware and software. Phones are compatible across all BE6000 solutions. The Cisco 2921 ISR, a general purpose router and PSTN gateway, will continue to work in that capacity in a BE6000M/H environment, while the UCS-E blade server can be repurposed to run virtualized back office applications such as accounting, billing or third party applications. Configuration data can be backed up from the BE6000S and restored on a new BE6000M/H, and licenses can be completely transferred if the customer has Cisco software support services; otherwise, they can purchase Cisco Collaborate NOW upgrade licenses at a reduced price. Toshiba America Information Systems Inc., Telecommunication Systems introduces the IPedge Virtual Server, a new virtualized software-only version of the company’s IPedge business communications system that allows IPedge to co-reside with Toshiba’s contact center and reporting software on a single server running VMware vSphere technology. Toshiba has designed the new product for the contact center customer looking to consolidate hardware and incorporate telephony components into their IT infrastructure, but a virtualized IPedge-only version is also available without the integrated contact center capability. Virtualization technology has emerged as an important advancement as it allows the consolidation of multiple software applications and multiple operating systems to run simultaneously and share the resources of a single physical computer. So, for example, an IT organization can run both Windows and Linux, or multiple versions of an operating system, along with multiple applications, on the same server. This more efficient use of hardware and computing resources translates into capital, operational and energy savings. With Toshiba’s virtualized solution, the Linux-based IPedge business communications system runs alongside Toshiba’s Windows-based contact center applications on a single VMware server. (Toshiba’s contact center applications have traditionally run separately from IPedge on an external server such as Toshiba’s Media Application Server.) The solution is a good option for companies looking to consolidate hardware for cost and operational savings. This includes simplified administration since all software is managed using the same Web-based administration tool (IPedge Enterprise Manager), as well as simplified licensing with a single license file for both IPedge and the contact center functionality. Toshiba’s IPedge already embeds several applications within the standard software, namely call processing, voicemail, unified messaging, centralized management, UC client software and the company’s Meeting application for audio, Web and video collaboration. A single IPedge Virtual Server can also run Toshiba’s Automatic Call Distribution or ACD enhanced feature set which includes priority and skills-based routing, intelligent announcements and an Interactive Voice Response (IVR) self-service capability among other features that can help to ensure a positive customer experience. Reports can be generated for analyzing agent performance, group activity and system status. Optional advanced features for Web Callback and Web Chat are also available to facilitate online customer interactions. IPedge Virtual Server is pre-installed on a Toshiba-provided server running VMware ESXi 5.5. The configuration options line up with the traditional IPedge EP, EC and EM server configurations: the Virtual EP Server targets smaller businesses with 8-40 employees (users), while the Virtual EC Server supports 200 users and the Virtual EM Server handles up to 1,000 users. There are also options for redundancy (RAID storage). All configurations support up to 360 licensed agents and supervisors if the contact center capability is integrated and activated. Toshiba IPedge Virtual Server, generally available as of January 13, 2015, comes in three versions: (1) an IPedge-only version without contact center and reporting capabilities, or (2) a contact center-ready version (pre-installed and ready to activate when needed), or (3) the full version, with IPedge, contact center and reporting fully integrated and licensed. Unified Communications as a Service (UCaaS) continues to gain in popularity, and analyst findings indicate that adoption within a variety of verticals is accelerating, including in the contact center, healthcare and education market segments which are on track to have very large growth within the next five years. Research and Markets estimates the cloud-based contact center market will grow from $4.15 billion in 2014 to $10.9 billion by 2019 (a compound annual growth rate of 21.3%). Market analyst firm BCC Research projects the global telehospital/clinic and telehome market will grow to $43.4 billion in 2019, up from $16.3 billion in 2013 and $19.2 billion in 2014; this includes home-based telehealth technology that will rise to $24 billion by 2019 (up from $6.5 billion in 2013). Research by Docebo on e-Learning market trends finds this to be the fastest growing market segment in the Human Resource macro segment, and says adoption of the Software-as-a-Service (SaaS) model is playing a significant role. The worldwide market for self-paced e-Learning is projected to reach $51.5 billion in revenues by 2016. Cloud UC provider TeleSpeak and contact center provider Voice4Net are two vendors collaborating to develop cloud-based services that specifically address these key, high growth industries. The targeted solutions will leverage Web-based real-time communications or WebRTC, an emerging open standard that allows the creation of browser-based applications for interactive real-time communications with voice, video and data. Voice4Net has offered multimedia customer interaction, IVR, screen pop, outbound dialing, speech recognition, voice recording and other contact center solutions since 1996, and now, is redesigning its solutions using WebRTC technology, as well as leveraging this framework to develop new solutions for other vertical markets such as healthcare. TeleSpeak entered the market in 2010 with a cloud PBX service based on Asterisk software, and subsequently developed a contact center offer (also based on Asterisk). The solutions are sold primarily through channel partners to small, mid-size and larger enterprises in North America and Europe. The next versions of TeleSpeak’s ‘PBX Anywhere’ and ‘Contact Center Anywhere’ are being built upon the WebRTC solutions from Voice4Net, as are several new vertical-specific ‘Anywhere’ services that the company views as differentiators from many competing cloud providers that position a hosted PBX as their central offering. These include ‘Office Anywhere’ for group collaboration, ‘Contact Center Anywhere’, ‘HealthCare Anywhere’ and ‘Classroom Anywhere’. Read more here about the WebRTC-driven TeleSpeak ‘Anywhere’ cloud services due out in first quarter 2015. 8x8 has made a series of announcements lately, including a new suite of hosted analytics and reporting tools (Virtual Office Analytics) and the expansion of its cloud unified communications services into the Asia Pacific region. The company opened a new data center in Sydney, Australia and now maintains eight data center operations in five regions of the world – United States, Canada, United Kingdom, Hong Kong and Australia. 8x8 is also working on an integration of its Virtual Office and Virtual Contact Center solutions; the integrated platform, which aims to improve customer service and productivity, is expected to become available by the end of first quarter 2015. In other news, 8x8 was awarded several US patents, related to Web-enabled conferencing, unified messaging, security, network services and telephone device monitoring, surpassing a milestone of 100 patents (now at 102). Avaya continues to evolve the IP Office communications platform for small and mid-size organizations and enterprise branch offices. The latest release (December 22, 2014) further expands the addressable market, introducing a new offer called IP Office Select which raises the capacity, improves resiliency and enhances the functionality to serve larger mid-market customers with up to 2,500 IP users and up to 150 sites. A virtualized version can be deployed on-site or in the cloud. IP Office R9.1 also integrates Web collaboration and adds other unified communications improvements. See the write-up “Avaya Expands Addressable Market with IP Office Select” for more detail. Avaya introduces new enterprise solutions for customer engagement and contact center efficiency, including “Snap-Ins” to add speech analytics, mobility and other capabilities to existing contact centers, as well as a cloud-based social media monitoring service (Avaya Social Responder) and consulting services for migrating legacy contact center operations. Avaya and Google are collaborating and have introduced Avaya Agent for Chrome, a WebRTC interface on Google Chrome device, as the initial offering. Avaya is also addressing the hybrid cloud opportunity with new partnerships and services aimed at businesses transitioning toward a public cloud delivery model. Avaya and cloud infrastructure provider Spoken Communications are working together to offer a hybrid cloud Contact Center as a Service (CCaaS) solution for enterprise contact centers. And, in partnership with VMware, Avaya is offering its customer and team engagement applications as-a-service hosted on the VMware vCloud Air platform. In other news, a new AvayaLive Video service offers a conference room in the cloud for up to 25 participants per room ($99 per room per month; free 30 day trial). AVST announces Release 8.6 features for its CX-Series unified messaging products, including increased scalability to 750 ports per system and multilingual speech recognition among other new features. A new cost-effective, informal call center add-on solution called TeamQ supports up to 250 agents and provides automatic call distribution (ACD), agent desktop control with screen-pops, call prioritization, supervisor interface, real-time reporting, call queuing and other “essential” call center features. TeamQ is available as an add-on to AVST’s CX-S all-in-one unified messaging suite for smaller businesses and CX-E for medium to large enterprises (CX-E was formerly known as CallXpress). Cisco introduces the new Business Edition 6000S, an all-in-one business collaboration platform with pre-configured and “essential” virtualized applications suitable for the low-end of the mid-market or branch offices with 25-150 users. See the write-up “Cisco Introduces Business Edition 6000S for Smaller Offices” for more detail. Digium is offering the new Switchvox Rescue disaster recovery cloud service for on-premises Switchvox business phone systems (requires the latest Release 5.11 software). The service protects against unexpected downtime by providing a temporary backup system hosted at a Digium Cloud Services datacenter. A recent copy of the Switchvox configuration is maintained in the cloud, and upon notification by the customer, this system can takeover in the event of an on-site outage. Switchvox Rescue is available to order as of February 2, 2015 for $90 per month (an introductory price of $45 per month is available for a limited time). In other news, Digium adds a softphone capability to its Switchvox mobile client for iOS devices. With the downloaded application, an iPhone emulates a Digium IP phone, allowing Digium Switchvox business phone system users to make and receive calls in addition to checking voicemail, setting and viewing presence status information, holding 3-way conferences, recording and transferring calls and more. A softphone for Android client is set to follow. Facebook targets the enterprise with a new work-oriented version of its online collaboration service. Facebook at Work, now in pilot testing with selected enterprises, is currently a free application for iPhone and Android devices. Business users will have access to similar Facebook features like news feeds, groups and messaging, but is only for internal company communications. The application keeps sharing at work separate from a personal profile so that user information is not accessible publically. Facebook’s own employees have been using Facebook at Work internally for years, according to the company. General availability is tentatively scheduled for later in 2015. Fonality enhances its HUD Mobile client for iOS and Android smartphones and tablets with a new design and new features over and above the earlier version. New capabilities include automatic call routing, setting location and presence (availability) and simultaneous ringing of a deskphone and mobile device without manual intervention. Additionally, HUD Mobile defaults to transmitting voice over the carrier network rather than over WiFi which can result in improved call quality when an enterprise-class Wi-Fi router is not in place. HUD Mobile is free with Fonality Professional and Fonality Ultimate editions. In April 2014, Fonality consolidated product lines, now offering its business phone technology as three editions: Fonality Essentials (cloud only), Fonality Professional and Fonality Ultimate (cloud or premises deployments). Grandstream introduces the new SIP-based “Wave” softphone application for Android devices. Business and residential users can download the free application to any Android device (version 4.0 or higher) to make and receive voice calls over a Wi-Fi network. The application supports up to six SIP accounts, 6-way voice conferencing, call transfer, LDAP phonebook integration and more. Busy Lamp Field or BLF keys (24) allow users to monitor the status of other users on Grandstream’s UCM IP-PBX system or other SIP-based system. In other news, Grandstream is beta testing a new, single-line Linux-based business IP telephone for small and mid-size businesses and the small office/home office market. Interactive Intelligence releases the first in its series of PureCloud unified communications and contact center cloud-based solutions running on Amazon Web Services (AWS). The new, informative corporate directory called PureCloud Directory is designed to enhance employee collaboration by listing more than just names, titles, emails and phone numbers. The directory also lists certifications, work history, education, location and other attributes. Users can use an advanced search capability to filter results and can view real-time status information, with one-click communication by voice, email or instant message. PureCloud Directory integrates with Active Directory, Human Resource systems and CRM programs such as Salesforce.com. PureCloud Directory is accessible via Web browser and iOS, Windows Phone 8 and Android mobile devices. The service is currently offered in North America, with additional regions to follow. Microsoft releases a beta version of Skype Translator, a new real-time translation tool that translates speech into another language during a Skype video or voice call. The translated conversation is presented as both audio and text (an on-screen transcript is displayed); users can also send instant messages in other languages. Skype Translator is the result of Microsoft research in speech recognition, automated translation and general machine learning technologies, and during this preview program, the company will incorporate feedback from users to continue to advance the technology. English and Spanish languages are currently supported, with 40 languages planned for the future. A Windows 8.1 or Windows 10 Technical Preview desktop or tablet device is required. RingCentral announces two new integrations, including a new integration with Google for Work that allows RingCentral Office users to manage calls, conferences, and voicemail from within the Google Gmail account. Users can combine RingCentral and Google contacts into a single, searchable screen, view consolidated history information for calls, texts, faxes and voicemails, as well as schedule RingCentral Meetings and conference calls from the Google Calendar. RingCentral Office customers can also now subscribe to the Zendesk cloud-based customer service system for creating, tracking and closing trouble tickets. In other news, RingCentral introduces a HIPAA-compliant RingCentral Office solution (RingCentral HIPAA Business Associate Agreement (BAA) Program) aimed at healthcare organizations that need to protect patient data. ShoreTel makes the latest version of its ShoreTel Mobility solution (version 8) available for customers that subscribe to the ShoreTel Sky cloud unified communications service. ShoreTel Sky Mobility allows users to make and receive calls from their mobile device over a Wi-Fi, 3G/4G or cellular network. The new version enhances communications with single touch, two-way video calling between iOS and Android smartphones and tablets, as well as a “join” button for joining a multi-party, room-based video conference. ShoreTel Sky Mobility is available now for U.S. customers and can be downloaded from the Apple or Google Play stores. Toshiba America Information Systems Inc., Telecommunication Systems Division rounds out end user device options for its UCedge productivity application, now supporting Windows and Mac desktops in addition to the Apple and Android smartphones and tablets already supported. Toshiba introduced UCedge in September 2014 as a rebranded and enhanced version of its earlier Call Manager Mobile and Call Manager for Windows UC clients. 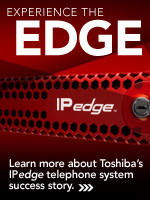 In other news, Toshiba introduces the IPedge Virtual Server, a new virtualized software-only version of the company’s IPedge business communications system that allows IPedge to co-reside with Toshiba’s contact center and reporting software on a single server running VMware vSphere technology. See the write-up “Toshiba Combines Call Control and Contact Center on New Virtual Server Platform” for more detail. Vertical Communications introduces CRMLink, the company’s first cloud-based service for customers that have deployed the premises-based Wave IP telephony and unified communications platform. CRMLink integrates Wave IP with major Web-based CRM platforms such as Salesforce, Microsoft Dynamics CRM and NetSuite. The service automatically logs incoming and outgoing calls from the Wave IP system, including from mobile devices (via the ViewPoint Mobile application), and integrates these with CRM programs to produce screen pops with caller information that can be previewed before answering to improve the customer experience. As a cloud-based service, Wave IP users simply sign up and purchase user licenses as needed; no additional software or hardware is required. In other news, Vertical subsidiary Fulton Communications (acquired last June) has purchased voice and data communications provider Voice Systems, a Vertical partner based in Boston, extending the company’s presence in the northeast region of the United States. Yealink Network Technology Ltd, a China-based voice and video over IP phone designer and manufacturer, has added a new desktop model to its T2 Series of IP phones for business users. The new SIP-T29G dual-port Gigabit phone represents the most advanced phone in the T2 series. Notable features include a 4.3-inch color display, a flat user interface and Yealink’s Optima HD voice technology for “life-like” audio quality. Additional upgrades are planned. The T2 Series now includes eight models to suit a range of business requirements. Use of the open standards-based SIP protocol makes the Yealink phones interoperable with a wide range of SIP-compatible telephony systems and hosted/cloud services worldwide.